One of the biggest weight savings that can be made by backpackers, moving towards lightweight, is to change their pack. Many backpackers that I see on trails are still carrying packs that are around 3 kilograms in weight, and sometimes even heavier. These packs are sold on the basis that they are both bombproof and really comfortable. However, from a lightweight perspective, the good news is that packs that are far lighter can be just as durable and even more comfortable. 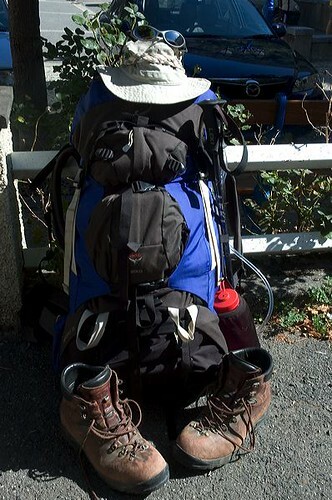 For several years I backpacked with an Osprey Crescent pack, which weighed about 3 kilograms. On the flat this was a very comfortable pack but as soon as I hit a real incline I was struggling. The Crescent easily has a 70 litre capacity and for the kind of backpacking that I have taken for ‘my reference’, this is far too heavy. The pack also had far too much volume. Now matter how hard you try, if you’ve got that space, you’re going to think about filling it and this – more often than not – means extra weight. I was in the Pyrenees three or four summers ago when I had my own lightweight epiphany. I wasn’t climbing a particularly steep climb. But it was a hot day but the two person tent I was carrying was saturated with water picked up during the morning’s storm. My pack was full and I was carrying a lot of drinking water and food. I can still remember the point on that climb when I decided I would never carry that much weight again! Heavyweight: Osprey, Scarpas, et al. If this strikes a bell inside your head, then this is the post for you. And you’re in luck. Let’s look lighter. Well, staying with the mainstream manufacturers, there are a mass of ‘lightweight’ packs that come in at between 1.5 and 2 kilograms, for example, the Osprey Aether, many of the Gregory packs and the Mountain Mover from OMM. You may be tempted with these and – judging from this year’s Challenge they’re getting more popular. But we can do better than that! There are now a fair number of weight carrying packs that come in at around 1 kilogram. My main weight carrier is now a ULA Catalyst that comes in at just a little over a kilogram. Using a combination of pockets and main compartment ULA reckon that the capacity of this pack is 70 litres, but in reality the main chamber is more like 40. Yet because the wide design this is an easy pack to load and the pockets provide real versatility. My ‘reference’ Challenge load fits easily into this pack, plus food for five days or so. And yet, in many ways, I could have tackled the Challenge with a smaller pack – say the ULA Circuit. But you don’t have to import from the US to get a pack this comfortable and light. The Golite Quest is a very impressive pack, with a fully featured back system, a capacity of 72 litres and a weight of 1.4 kilograms. In many ways this pack is too big and too heavy but it might be an ideal target for someone wanting to she half their pack weight but who is still a little unsure of this lightweight lark. The Gregory Z pack is in the same league, 1.5 kilograms and very comfortable.. But I would consider by-passing the Z Pack and the Quest and going for something around 1 kilogram as a starter. One of the most impressive packs I saw on this year’s Challenge was Maurice Gray’s Granite Gear Vapour Trail. This pack weighs about 900 grams and looks to be very comfortable. Maurice reported that it was as comfortable as it looks. The Vapour Trail has a capacity of over 50 litres, but it looks as if it can swallow most Challenge loads. Maurice, while not being a heavyweight hiker, was certainly not a lightweight gram counter! Granite Gear get away with this by some clever use of fabrics, re-enforcing key points with tough material but using much lighter stuff for those areas that are not so critical. This pack is not as durable as those weighing twice as much. But it would seem to be more than durable enough for a British backpacking trip. Increasingly we are going to see mainstream producers coming in at about the 1 kilogram mark. Osprey have developed quite a following for their ‘lightweight’ Atmos system, a 50 litre sack of around 1 kilogram. The Atmos also features a breathable cavity back system. I had one for a while I couldn’t get on with it for backpacking. But there are many who love these packs. One big bonus is that you can often find them in the High Street. But. for me, the Vapour Trail beats it hands down. So, use the Vapour Trail – or equivalent – and a three litre sack hiker can instantly shave 2 whole kilograms off their base weight. If you really want to see how impressive this is, try picking up 2 kilograms worth of sugar, next time you are in the supermarket! The Vapour Trail will take your Challenge-type backpacking load. Alan Sloman completeed his Lands End to John O’Groats walk using an Osprey Atmos. Alan is often the scourge of the lightweight brigade, but he still managed to get all of his gear into this sack. So, 1 kilogram and 50 litres. You don’t need more. But. as we begin to look lighter things begin to get very interesting. As we begin to move well below 1 kilograms there are sacrifices that have to be made. But they’re not that great as sacrifices go. The Golite Pinnacle pack has taken the backpacking world by storm this year. The Pinnacle weighs just 700 grams but has a capacity of 72 litres. The Pinnacle is made from Dyneema material which, although lightweight, is surprisingly durable and tough. All of my packs are made of Dyneema and I haven’t had the slightest worry about them being knocked about. So, how is this done? To get this light Golite have had to sacrifice the usual back system. There is no clever mesh system here, with load of hi-tec air channels. The back of the pack is simply made of the same Dyneema fabric. Inside of the pack there is a small foam pad that slips down the back and gives you a little protection. A little more car is needed in loading this pack so that it remains comfortable but once you have the knack you’re away. I’ve met four or five hikers using the Pinnacle this year and they’ve all declared themselves to be very happy with it. You might worry about the back system; does it not get too sweaty? Once loaded you can ‘shape’ these packs to create a cavity in the back. My next pack uses this system and – to be honest – it is just as comfortable as those packs I’ve owned that have all kinds of clever air cooling back systems. When your carrying a big load in the summer, your back will be sweaty. So, the Pinnacle easily copes with a Challenge load. We’re talking about the same capacity as a 3 litre dreadnaught here – but we’ve saved well over 2 kilograms of weight. But, before we move on, just one more word about these packs. The Pinnacle costs about Â£100 – very competitive for a pack of this size. But we can do better still …. My ULA Conduit is now taking over as my main backpacking sack. It weighs in at about 5.5 kilograms. It is a smaller sack than the Conduit but I reckon – with careful attention – I can get my Challenge load in here. This summer I’ve been carrying a tarp in it but I’ve been out with my share of a two person tent, which weighs about 1.6 kilograms. This pack has a very useful hip belt, great pockets and can carry up to 12 to 13 kilograms without being uncomfortable. The Conduit is typical of packs in this class in that it needs a little helping hand to make it work. In this case there is no padded back in the pack at all but an internal sleeve in which you place your sleeping mat. The sleeping mat protects the back and also gives some stiffness to the back off the pack. The Golite Jam (600 grams/50 litres) is a similar design and capacity. Both packs are very durable – being made of Dyneema – and both are probably up to a Challenge walk, with some careful planning. Although these packs are stripped down they can be very comfortable. These are packs for people who have lightened other areas of their loads and, therefore, are something to aim for over time rather than to jump into immediately. 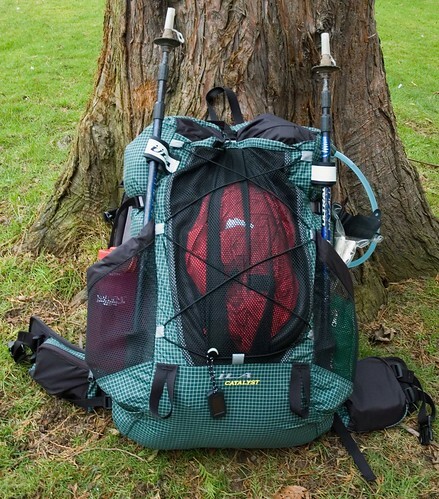 But, in many ways, the Conduit is my favourite ever backpacking pack. The Gossamer Gear Mariposa (and Mariposa plus) packs are also in this weight range. These are constructed of even lighter fabrics but this allows them to use carbon pack stays for stability and load spreading. The Gossamer Gear packs are available in the UK through Winwood Outdoors of Keswick – so if you’re travelling to the Lake District you can actually get to try them out. If you cast your eyes over the internet you’ll find a wave of ultra lightweight pack manufacturers producing all kinds of whacky designs with ultralight fabrics. These may be more problematic in the UK where our terrain is harder and the climate means that we do tend to carry slightly heavy loads. Nevertheless, some of these look fine designs and a number of them have found their way in the gear stores of some UK walkers. Mountain Laurel packs look very interesting and one of two people around here us them. Well, it is possible to shed even more light but this depends on a full range of ultralight gear. For tarping overnighters, in the summer, I use my ULA Relay which weighs in at 480 grams. I reckon – with careful use – I could do multi-day hikes with this but – in all honesty – the law of diminishing returns kicks in and I find the Conduit is a more flexible and comfortable option. ULA are reasonably typical in the way that mainstream – if small – manufacturers are beginning to play around with even more lightweight materials. Their Amp pack weighs a little under 300 grams and will carry almost 10 kilograms. Their forthcoming Ohm pack, perhaps, shows where more manufacturers may be going. At 500 grams this pack is designed to carry up to 13 kilograms – which certainly brings it into Challenge territory. So, that’s my story of lightweight packs. For my ‘reference’ weight you really shouldn’t even consider anything heavier than 1.5 kilograms, but go to 1 kilogram and you won’t be suffering in terms of comfort or the ability to carry the load you need. And the brave may even start even lighter – the Pinnacle at 700 grams is, in many ways, an ideal backpacking pack. With experience -and confidence – pack weight can drip to about half a kilogram. These are the packs that can be considered to be ultralight as they – combined with a lightweight load – will bring you in at 4 -5 killograms. This may not be for everyone but it’s an interesting benchmark to plan against, or to aim for. Purchasing these packs often means buying over the net. But e-retailers and small manufacturers are happy to talk over the phone or by email. Some can be seen in the flesh in the big gear centres of Keswick and Betwys-y-Coed. I’ve mentioned a number of packs here. There are, of course, others that will work well. You’ll want to do your own research and come up with your own solutions. There really is no excuse for that 3 kilogram pack. You can easily save 2 kilograms in one go. As we apply this thinking across the kit range, you can see that it’s not impossible to reduce your weight significantly, without compromising safety. And lightweight loads are far more comfortable. Thanks for the time & effort spent on this article Andy. This post made me go off and recheck my current pack weight. For a 5(?) year old ex Scoutshop “generic” 50+15 pack it weighs in at a paltry 1.65kg, with integral rain cover. Now I know i could shave weight off that, but not a huge amount if i want to retain the aforementioned baggage/transport function. But nevertheless you’ve reminded me of a few ideas that are worth relooking at. I guess it will come down to how much do I want to spend, for what weight saving. An easy answer for a 50% mattress weight saving for Â£50, but a bit different if its more like 25% for Â£150. But a good informative piece, and one that i reckon we’ll be linking thru to for some months to come. Yep John, there are choices to be made along the way. I don’t suppose many people go out and buy the whole lightweight kit thing in one go. most of us have to get there over a period. Perhaps one more thing: in changing to a lighter and more compact load, a pack is one of the last things one should change. Certainly the lightweight and ultralightweight ones which are often not only lighter but also smaller in volume. I guess it can be very tempting to go for a lightweight pack but this doesn’t make any sense as long as other parts of your load haven’t been lightened. To some extent this is true when you get to the low end, but packs like the Catalyst can cope with quite a load – which is why I’ve tried to produce something like a route map. Thanks, Andy, some good points. The only way of going seriously lightweight is to take an axe to the heaviest items and packs are the worst offender. It is frustrating that there’s so little choice below 1kg. I think Gossamer Gear and Golite have done us a real favour by showing what is possible. Iâ€™m probably going for the Mariposa Plus when itâ€™s available. It would be interesting to hear from Bob about is experience of the Pinnacle on the Challenge. I found the Golite Trek to be somewhat flawed. In particular I thought it was too soft without a frame (I improvised one), the shoulder straps are too hard (bruising my shoulders) and the hip belt was not supportive enough. Itâ€™s a shame because everything else was fine. Along with boots/shoes, packs are the most important thing to get right as a badly fitting pack at best is uncomfortable and at worst painful. The only thing worse is badly fitting footwear. Bob will be taking – at length – about his gear on the TGO Podcast – though probably episode 10! Another option might be the ULA Circuit or the Vapour Trail – both 900 grams with frames. Good article Andy,my own choices are the granite gear vapour trail & virga,gossamer gear whisper & the revelation from mountain laurel,bit of a pile i know but i now can fine tune my kit list for the trip,can reccomend them all highly. A very interesting article…I was considering my own overnight pack and considering that it weighs a bit much. I enjoy all this talk about gear but one issue that is not covered is country of origin. Increasingly gear seems to be made in China…Icebreaker gear used to be made in New Zealand but the last top I got is made in China. I like Paramo because of the ethical sourcing policy and try to get gear that’s made in the UK. Am I daft? What I am trying to say is that should other issues come into gear choice than weight? Philosophical point I guess. No Neil, you are not daft. I agree with your sentiments entirely. Expect an ‘ethical’ post shortly. The biggest weight savings to be had when going lightweight is the big three: sleeping bag, shelter, and backpack. In shaving the weight of these, I’ve found that the backpack is probably the last item you should replace, because you need to understand the volume required by the sleeping bag and shelter first. For example, a down bag and a tarp require a lot less space than a synthetic bag and a tent, and in turn you can save a lot more weight by using a smaller volume pack. I have two ultralight packs that I use mainly, a GG Mariposa Plus and a Six Moon Designs Starlite. I also own a GoLite Pinnacle, but it is vastly inferior to these two and I’m going to unload it. Thought you might be interested in my progress towards a lighter treking. I did the John Muir Trail in 2010 with far more weight on my back than I should have and so after my brother’s suggestion that he wanted to do the JMT with me in 2013 we have embarked on getting the load lighter. We have just been to Switzerland to do the Walker’s Haute Route so we used this a trial for the JMT next year, camping and carrying 10 days food on our backs. After seeing the number of ULA Catalysts on backs in the Sierra Nevada we did consider these but in the end plumbed for the British Lightwave Wildtrek 70l pack, coming in at just over 1.5kg. They were absolutely superb – really comfortable even with 10 days food and campling gear. The sack is well made and the material used looks like it will take some hammer. Other successful weight saving was in the sleeping bag department with the Go-Lite Adrenaline 3 bag which again was fantastic. Along with the use of a Exped Synmat I have already saved about 8ibs on my 2010 trip. Have put the details of my trips on my website at http://bigwalksclub.co.uk/. Thanks for sharing your ideas on light weight.